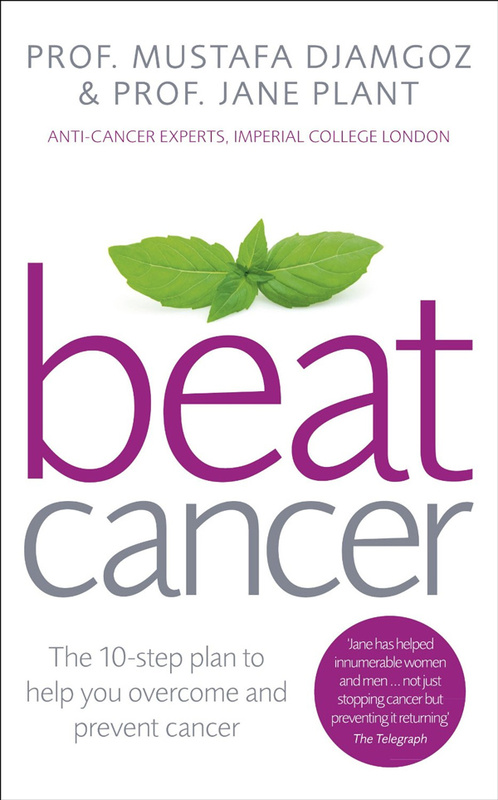 BOOK REVIEW: BEAT CANCER…THE 10-STEP PLAN TO HELP YOU OVERCOME AND PREVENT CANCER. If you or someone you love has been diagnosed with cancer, you want to do everything possible to beat the disease. But with so much conflicting advice and so many options available, how do you decide on the best treatment plan for you? In this new book (released May 2014), Professor Jane Plant and Professor Mustafa Djamgoz present a 10-step programme to help you beat cancer. At a time when you may be feeling helpless and confused, this book provides the essential guidance you need to take control of your life and regain your health. Step 1-Inform Yourself: reveals the latest findings about cancer cells and what they do. Step 2-Find your balance: explains the importance of balance in body and mind, the need for an integrated approach and the levels of healing needed for recovery. Step 3-Choose the right conventional therapies for you: details symptoms of cancer, information on screening, diagnosis, procedures and treatments including supportive and emerging therapies. Step 4-Know which complementary therapies can help: separates and explains therapies that support treatment from those you should avoid. Step 5-Eat to beat cancer: reveals the latest diet-linked research and details the Ten Essential Food Factors in the Beat Cancer diet that Prof Plant uses herself, which include eating an organic, alkaline, varied diet, cutting out dairy and reducing salt and sugar. Step 6-Protect Yourself with exercise: how exercise protects against cancer and aids recovery if you are diagnosed. Step 7-Be aware of your environment: how to limit your exposure to the Big 3 (pesticides, perfumes and plastics) plus simple measures to reduce your exposure, including advice on household and skincare brands, hair dyes and mobile phones. Step 8-Manage stress: how to cope if you have a cancer diagnosis and how to find support. Step 9-Broaden your awareness: why charities, doctors and the media are often constrained in the information they provide and why making decisions for yourself based on knowledge will enable you to take your life firmly into your own hands. Step 10-Stay on course: how to stay in remission, keep healthy and alert, and live your life. Of all the above Steps, we feel that Step 5—Eat to beat Cancer is the most important as this was the main factor that helped Prof Jane Plant survived breast cancer since 1987. In this chapter, the authors advocate 10 essential factors—these are: to eat real food, eat organic, to balance the diet, reduce intakes of acid generating foods, know good carbs and bad carbs, know the right fats, cut down on salt and sweeteners, know what to drink and lastly, to eat nutritious foods rather than supplements. Doctors will never say that cancer is cured: only that it is in remission. If even a single cell remains after treatment, it can replicate and start the cancer growing again. Cancer cells have an extraordinary ability to transform themselves. This means that treatments like chemotherapy, which are aimed at killing them, may actually encourage the development of drug-resistant cells which survive treatment and form a new cancer. Aggressive chemotherapy aimed at destroying the cancer may not be the best treatment. In fact, it may be better to control the cancer and stop it from proliferating and spreading rather than trying to kill it outright. Radiotherapy uses radiation to kill cancer cells by damaging their DNA. It can also act indirectly by interacting with water molecules inside cells, creating highly reactive and unstable free radicals which further disrupt the cell. Hormone therapy is not a cure-all, as cancers can eventually become hormone resistant. Monoclonal antibodies (so-called “magic bullets”) may damage other tissues not connected to the original cancer. Drugs mean big profits for manufacturers, distributors, lobbyists and PR agencies! When the stakes are so high it is hardly surprising that the voices of those who advocate prevention as well as cure are difficult to hear. Charities, research institutions and healthcare providers also have to work with whoever is the government of the day. So they have to be seen to ‘fit’ the established way of thinking, talk the right language, and be wary of rocking any boats. Otherwise, they may see their funding dry up….their focus is often on the economics of business, rather than public interest and safety. There are a lot of controversies over breast-cancer screening….for every life saved; three women had treatment for a cancer that would never have become life threatening. Likewise mass prostate screening results in over-diagnosis which could mean some men could face unnecessary treatment with drastic life-changing consequences. CT scans use more ionizing radiation than regular X-rays…repeated CT scans might eventually cause a second cancer. Vested interests in the food industry manipulate politicians and others in the cancer establishment. Evidence is clear that it is the Western diet, full of animal-based foods such as meat and dairy and refined and processed food that is a large part of the cancer problem. The biochemistry of how our bodies process the food we eat is complex, yet medical training contains little, if any, nutritional biochemistry. With such limited knowledge of expert science, perhaps it is not surprising that many doctors and experts and dietitians continue to reject the role of diet as part of cancer treatment. Worse, they (doctors and dietitians) even recommend foods that have been shown to promote cancer by leading researchers in the best universities in the world. The above are just some of the “shocking information” found in Beat Cancer….there are a lot more shocking information waiting for you to discover. If you are interested, have a chat with us.